Many people dislike being categorized based on their love of technical things, computers, games, design or just general love of knowledge. Others, generally dorks, love to categorize everything. To make life easier for everybody, someone kindly created a Venn diagram. I have lost the source, but will start seeking it. I guess it was a Dweeb somewhere in America. Anyway, which are you? 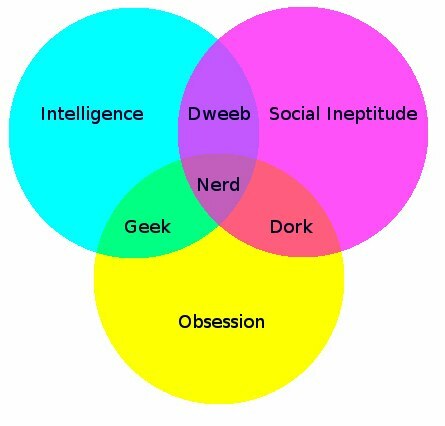 Geek – A person with an eccentric devotion to a particular interest: “a computer geek”. Dork – A dull, slow-witted, or socially inept person. Nerd – An intelligent, single-minded expert in a particular technical discipline or profession. ← Google TV Is Coming To A Living Room Near You!